Twilio recently optimized its platform to accommodate programmatic SMS messaging at scale. 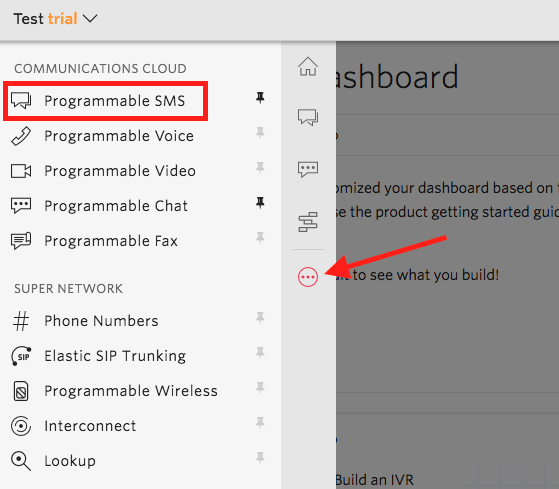 This upgrade allows for the creation of a messaging service, which enables you to dedicate multiple local Twilio numbers to a single channel, and improve SMS delivery with phone number intelligence via the new Copilot features available in your Account Portal. Reroute - if you're using a short code, your Twilio will automatically revert to standard long-code phone numbers when a carrier is unable to receive messages from short codes. When multiple channels of the same type are connected to your Nyaruka account, the channel that the contact last messaged will be prioritized. Contacts can be locked-in to a relationship with a specific channel (they'll only receive messages from this channel). Geo-Match and Sticky-Sender ensure that even if your contact sends a message to the wrong channel, they'll always receive a response from the same number. 2. Create a new messaging service by first clicking on SMS on the lefthand side menu. Then, click the Create new Messaging Service button.